Flammable storage cabinets arrive at a site on pallets, often carried by forklift to their station. Keeping the flammable safety cabinet on a pallet may seem convenient. It makes it easier to move. It might also seem like a good idea to keep it elevated off the floor, so that any leak or chemical spill will be visible. Safety cabinets should always be installed per the instructions. It must be level to prevent it from distorting when loaded with liquids in containers. An unlevel surface will also affect how well the doors operate and close. Using the leg levelers is the only way to guarantee it is level. Leg levelers cannot be used if the cabinet remains on a pallet. Placing a chemical storage cabinet on a wooden pallet exposes the cabinet to a higher risk of fire than if it were sitting on the floor. The pallet provides wood fuel to burn. If the pallet fails in a fire, the cabinet could topple, contributing exponentially to the fire’s potential. Having a cabinet sitting on a pallet is not how the cabinet’s performance was evaluated during fire tests. The exposed surface beneath the flammable storage cabinet due to its raised height, may cause the cabinet’s internal temperature to increase much faster than it does during the fire test. Wooden pallets get damaged during transit from bumps and robust handling. Their construction with slats makes the surface of pallets uneven and they cannot provide adequate support at the cabinet corners. 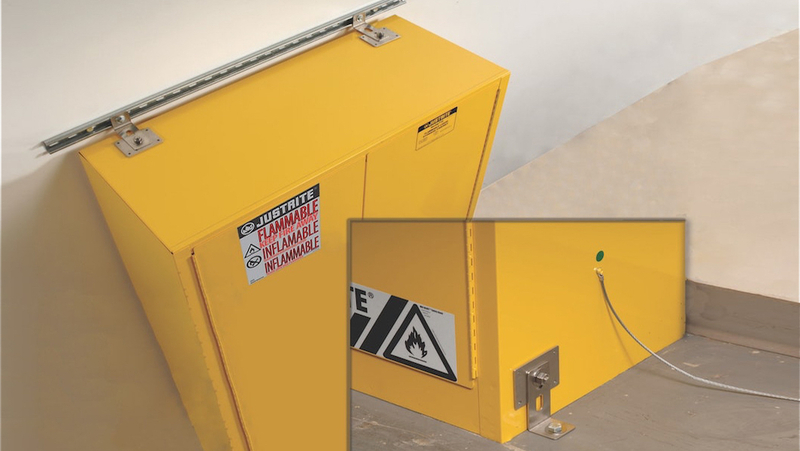 Flammable safety cabinets must rest on a level surface for maximum stability. Justrite even offers optional seismic brackets for securing safety cabinets to the floor or wall in earthquake-prone regions. Safety cabinets have leakproof sumps. The International Fire Code (5704.3.2.1.4) specifies that the bottom of a safety cabinet must be liquid tight to a minimum height of 2 inches. There is no need to keep a chemical storage cabinet elevated to track leaks. Although grounding safety cabinets is not required by federal law, it is a recommended best practice. If the chemical storage cabinet is used for dispensing, then it is essential, along with bonding the containers to one another. Grounding prevents the buildup of static electricity and the potential for sparks. Justrite technical experts can help you understand the various codes for storing flammable liquids. 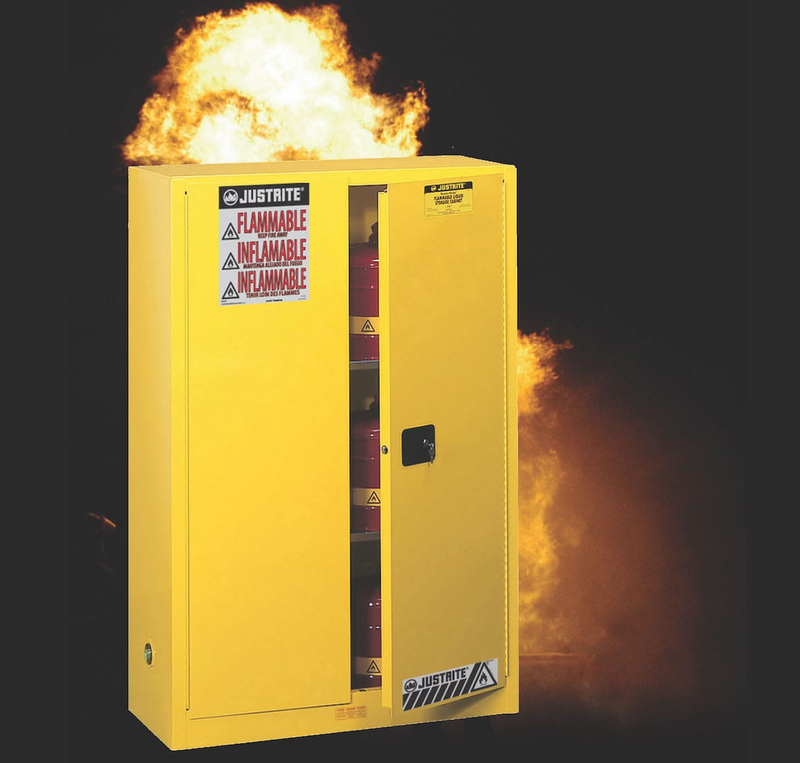 We supply compliant safety cabinets for flammable, combustible and other types of chemical storage. Don’t wait until you are fined or experience a safety incident at your facility. Browse our vast range of chemical storage cabinets here.